By BJ Bangs Irregular Staff Writer from the article HERE. AVON — September marks back to school, and for students at Maine School of Masonry in Avon, once they complete the nine-month course, they will be equipped with a trade —one that is wide open to those that want to “really become good at it,” said Steve Mitchell, owner and operator of the school. Fewer and fewer people are becoming masons, he said, much because it is a very physically demanding job. On the upside, he said, it’s very creative, and something that can last through history. Stone work has existed since the days of the pyramids. “It’s a really good program for the right kids… But they need to be motivated, and want to go out and find the contractors, become apprentices, and find the jobs,” he said. The school attracts people as far away as Wyoming. Last year, 11 students graduated. And it’s hands-on from the beginning, he said. They must complete 1350 hours of coursework, including 35 or more assigned projects. This year, classes start Tuesday, Sept. 6. Upon entering the 4,000-square-foot building, the old Lauri Toy Factory, on Route 4 in Avon, one sees the building area with last year’s fireplaces, chimneys, walls and archways still in tact until the fall class dismantles them, scraping the mortar, and making the bricks and stones usable for their own projects. It hasn’t been an easy road, said Mitchell, who took advantage of the Phillips MicroLoan program to borrow $10,000 for a forklift to bring materials into the building. That helped a lot, he said. He divides the school year into four nine-week quadrants. They start with beginning bricklaying where they learn about different bonds, corners, cleaning, tools and equipment. “They get the feel of bricklaying,” he said. Then, they move on to advanced bricklaying, where they learn how to build fireplaces and arches. There are 13 or 14 different arches. They learn how it all fits into place, he said. The third part focuses on block lying, where they work with four-, six- and eight-inch blocks, and learn to build stone walls, foundations and outside chimneys. In the fourth part they learn about dry laying (laying patio stones with sand in between them) and wet stones, which are mortared. Students also learn the value of volunteer work. 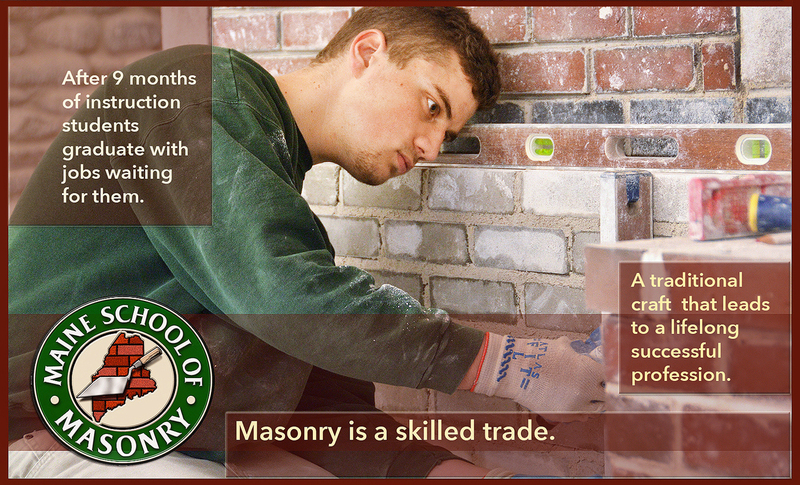 The masonry school has volunteered on projects in many area towns including Phillips, Farmington and New Sharon. This fall, they will be working on three projects: the pears that hold the fence at Farmington’s Hippoch Field; extending the rails and finishing the steps at the Little Red Schoolhouse at Farmington Fairgrounds; and extending the walkways at the Madrid Schoolhouse (now the historical society). “This trade is not just to make money, but also to help people,” he said. They’ve worked on churches, community buildings and town halls. Mitchell said he tries to stay away from individuals because their tastes are so different and diverse. That would be hard for the students to perform that advanced level of work. His two best students get a chance to spend the summer at the school getting even more hands-on experience. This is Mitchell’s seventh year operating the school. He travels to schools throughout the state, explaining the program and why it would make a good paying career. About 2,000 masons leave the trade each year with only 200 new masons coming in to replace them, he said. Because of this, a lot of wholesalers are capitalizing on veneer products, fake stones and brick that people can glue on the walls. Mitchell decided to go into masonry when he was a senior in high school. His father, Alden, taught industrial arts in Farmington, and then Mt. Blue High School. He didn’t want to follow in his footsteps, and found he didn’t want to teach, either. He obtained a degree in masonry from Northern Maine Vocational Technical Institute in 1973. When his apprenticeship ended, he started his own business. But of the 16 graduates in his class, only two are still in masonry. While his business was successful, he found himself drawn back to teaching. In 1980, he accepted a position teaching masonry at the Middle American Teen College for challenged youths from Chicago, New York and beyond, in Cape Jirdeau, Mo. He’s also taught masonry in vocational school and in adult education programs. When the Opportunity Center of Northern Franklin County formed in Avon in 2004, Mitchell became involved. Lauri Sibalkin, who owned the former Lauri factory buildings, asked Mitchell what he would do with the old toy factory on Route 4. “It was instantly clear,” he said. In 2004, he bought the building. The Opportunity Center helped him obtain a $5,000 grant from the Maine Community Foundation to purchase a large, reinforced trailer and some tools, and a grant from Sugarloaf/USA to buy tools. Since then, Mitchell has been teaching future masons, hopefully filling the need in a field where there is a tremendous shortage of skilled workers. It’s tough being the teacher and recruiter, he said, hoping to blanket as many schools as he can promoting masonry as a career field.